Congratulations, you are engaged and are in the process of planning your wedding. You are finding the prices of caterers, flowers, photographers, a DJ, live bands, invitations, favors and everything associated with your wedding to be astronomical and way above your budget. Don’t fret; I’m here to help you. I have some free wedding tips that are economical or totally free. To begin with, go to your local library and browse through their bridal books. For no cost at all, you can make a list of all the items that you will want to include in your ceremony and reception. Hint: To avoid a late charge, remember to bring your books back to the library by the due date. The Internet is another free source of wonderful, varied information that can guide you to the wedding of your dreams. 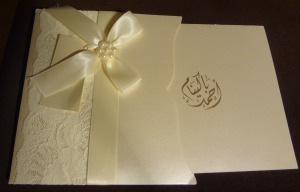 You can save a huge amount of money by printing your own bridal invitations. Boxes of fifty invitations along with the mailing envelopes and response cards, envelopes and test sheets range from $25 to $35. I strongly recommend using practice sheets of paper and envelopes before printing out your formal invitation and carefully check the boarders and spacing. Favors for Brides looking for free wedding ideas. How about this inexpensive favor ~ purchase a wine stopper and decorated draw string bag. Place the wine stopper in the bag, pull the string and wella, you have your favor. Another inexpensive favor idea is to tell the story of how you and your husband met, fell in love, and the enchanting proposal that followed. Insert a picture of the two of you, roll the paper and tie with ribbon that matches your color scheme. If you enjoy making crafts, how about taking that talent and make your own name card holders using pine cones that have dropped to the ground? Sprinkle some glitter on the edges and hot glue the name tag to the pine cone. This idea will dress up your entrance table and look quite unique. You can also make your own table numbers by purchasing card stock in your wedding color and you or a talented friend write the table numbers on the card and then affix the number to decorated box. You may also go to the dollar store and purchase a clear vase fill it with colored water to complement your color theme, place flowers in the vase and affix the table number to the vase. You now have created your ever so inexpensive table number, along with a vase that you can place flowers in to double as your centerpiece. Consider borrowing a family member or friend's bridal gown. Don't forget to have the dress dry cleaned before you return it to the person who lent it to you. Depending upon the time of year that you are getting married your church, synagogue, mosque or ceremony room and reception hall may already be decorated with the season's floral arrangements. 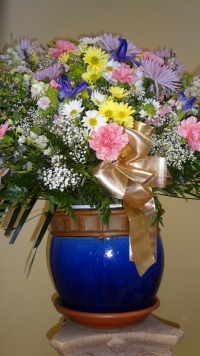 Ask before you spend any of your budget on flowers or decorations because they may already be there and they are free. There were two, of the above spring floral arrangements, on the alter of the church left behind, by a previous bride. Tip: check to determine if there will be a couple getting married ahead of you on your wedding day. If so, you may be able to contact the bride and find out if they will be leaving their floral arrangements at the ceremonial place. You may offer to split the cost with the bride or have the flower arrangements remain at your service with no cost to you. Another trip to the library or craft store will give you many tips and more free ideas for making favors, centerpieces, and decorations. This is an exciting time for you, your fiance, family and friends. Sit back, relax and enjoy my free wedding ideas. More tips and ideas on my welcome page.